Haven’t decided on a hotel yet? You can look at other available hotels in Limburg and North Brabant with Booking.com. By far, Limburg can boast of the greatest concentration of castle hotels in the Netherlands—reminders of the defensive response to the passing armies of history. This sliver of a province wedged between Belgium and Germany in the southeast has a different feel than elsewhere, with its character and culture more heavily influenced by its neighbors. Agriculture and industry will mark your first impression on North Brabant (Noord Brabant), but spend a little time here and you’ll discover an ancient historic past. Once the border of the Roman Empire, it wasn’t until the reign of Charlemagne when new towns popped up along trade routes that cut through the area. 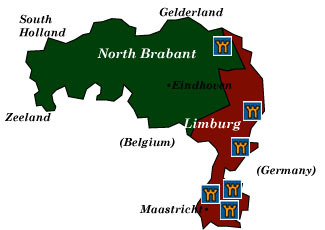 For nearly 400 years, North Brabant was part of the Duchy of Brabant—until the Eighty Years’ War split the region in half, with the north falling under the rule of the Netherlands. You won’t have far to go to find great castles and loads of medieval buildings. Maastricht Vibrant and cosmopolitan, Maastricht has played a role in European history from Roman times well into the 21st century. Begin discovering its rich heritage at the Vrijthof, its grand square filled with cafes and restaurants. Sint Servaasbasiliek (Basilica of St. Servatius) began life over 1000 years ago, with its nave, crypt, transept, and chancel still surviving today. The 12th century saw the building of the apse and two chancel towers. The treasury holds a rich collection of gold work, paintings, and St. Servatius’s shrine, which is covered in copper, enamel work, and precious stones. Onze Lieve Vrouwebasiliek is thought to date before 1000 A.D. and be built on the foundations of a Roman temple. The shrine of Mary Star of the Sea inside the basilica has been a place of pilgrimage for over four hundred years. Bonnefantenmuseum You can’t miss this landmark art museum with the silver-domed tower on the bank of the Maas River. Paintings and sculpture from medieval times to the modern period includes works by Jan Brueghel, Pieter Brueghel the Younger, and Rubens. Sint-Pietersberg Over 20,000 tunnels wind through caverns in the marlstone cliffs at Sint-Pietersberg, just outside of Maastricht. The tunnels have always served as a place of refuge—in Roman times and as a hiding place of great Dutch masterpieces (Rembrandt’s The Night Watch for one) from the Nazis in World War II. Guided tours take you past centuries worth of graffiti. Carnaval! Dating back to the 15th century, costumes, floats, parades, and a population given over to crazy celebration takes place on the weekend before Shrove Tuesday in either February or March. Netherlands American Cemetery and Memorial Plain white crosses mark the graves of 8,300 American soldiers who died in World War II. Den Bosch (s’-Hertogenbosch) This cathedral town has retained some of its medieval flavor in the town center. Be sure to visit the 16th-century Sint-Jans Kathedraal (St. John’s Cathedral) and take a look at the stone figures that decorate the flying buttresses. The Noordbrabants Museum exhibits artifacts from Roman times and the medieval era. Paintings include works by van Gogh, Brueghel, and Mondriaan. Canals. Tours of the town’s canals, some of which run beneath houses and streets, are a fun way to pass an hour. The Binnendieze is a network of canals in the town center; larger boats run along the medieval defensive and shipping canals. Castles of North Brabant include the well-preserved, 14th-century Kasteel Ammersoyen and the moated Kasteel Heeswijk. Kasteel Helmond is an imposing medieval castle surrounded by a moat. A local history museum, the Gemeentemuseum, is housed inside. Efteling If traveling with children of any age, this famous theme park offers fairy tales and magical lands where favorite characters come to life and roller coasters satisfy the need for speed.